From beginning his career as a small trader in Delhi to building Havells, one of India's largest electrical goods company, Qimat Rai Gupta's story makes for an inspiring read. Told rivetingly by his son, Anil Rai Gupta, this is the account of how QRG, as he was fondly known, braved poverty, ill health, competition, corruption and bureaucracy to turn his dreams into reality. Havells faced stiff competition from companies that couldn't tolerate a modest trader challenging them. Despite legal battles, family feuds and severe shortage of funds, QRG never gave up. During his last years, Havells acquired German giant Sylvania which was twice its size. When Sylvania's losses pushed Havells to the brink, QRG fearlessly decided to keep the company nonetheless. It was under his tutelage that Anil Rai Gupta, present chairman of Havells, turned Sylvania around. QRG's life is proof of the adage 'Whatever the mind can conceive and believe, it can achieve'. 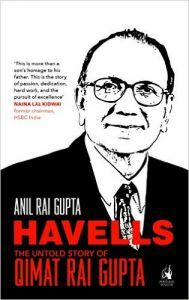 Anil Rai Gupta is the chairman and managing director of Havells India Ltd. He joined Havells in 1992 and climbed the ranks under the tutelage of his father, Qimat Rai Gupta. Anil led the acquisition of German lightings system company Sylvania in 2007. He was instrumental in its turnaround during and after the economic meltdown of 2008. Anil studied Economics at Sri Ram College of Commerce, University of Delhi, and has an MBA from Wake Forest University, North Carolina, USA. He lives in Delhi with his mother Vinod Gupta, wife Sangeeta and children Abhinav and Aradhana.